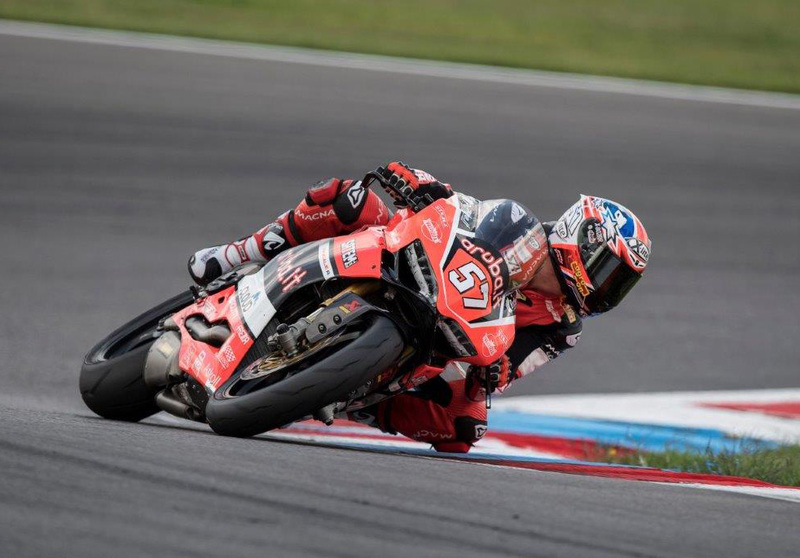 Michael Rinaldi (Aruba.it Racing – Junior Team) notched an important Superstock 1000 European Championship win in Germany, taking advantage of late mishaps for Federico Sandi (Berclaz Racing Team) and Toprak Razgatlioglu (Kawasaki Puccetti Racing). Championship leader Rinaldi was joined on the podium by teammate Mike Jones (Aruba.it Racing – Junior Team) and Roberto Tamburini (PATA Yamaha Official STK 1000 Team), as the race winner opened up a 26-point lead at the head of the standings. A three-rider battle between Rinaldi, Sandi and Razgatlioglu on the penultimate lap concluded dramatically – as Sandi ran across the gravel after touching Razgatlioglu and then shortly afterwards Razgatlioglu crashed out – to leave Rinaldi clear at the front. Behind Rinaldi, Jones and Tamburini it was Florian Marino (Pata Yamaha Official STK1000 Team) who finished a close fourth – beaten to the finish line by his teammate Tamburini by just 0.643s. Having been in the lead and looking comfortable at the front, pole man Sandi appeared to be in a great position for victory but ended up crossing the line fifth after his late off-track excursion. 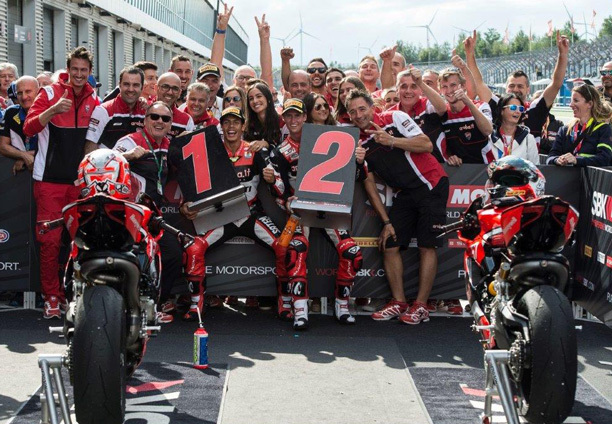 The likes of Jeremy Guarnoni (Pedercini Racing), Luca Vitali (Nuova M2 Racing), Sebastien Suchet (Berclaz Racing Team), Julian Puffe (Althea MF84) and Marvin Fritz (Bayer -Bikerbox Yamaichi) also finished in the Superstock 1000 European Championship top ten at the Prosecco DOC German Round. The Superstock 1000 European Championship riders will reconvene for their next race in just under a month’s time over the 15th-17th September weekend – at the Autodromo Internacional do Algarve, Portimão, Portugal.